TensileFabric designs, manufactures and installs tensile fabric structures for interior, exhibition or exterior use. As an interior specialist, we also have an extensive knowledge of issues related to acoustically poor interior spaces and have a variety of acoustic products to solve these problems. As well as our pre-designed ranges, we also offer a bespoke service (see portfolios above). Beyond this, we take on projects that diverge from our typical work, which we call 'special projects'. The frequently asked questions below should help you to understand more about how fabric structures work and what can be done with them. Please don't hesitate to get in touch should you need any further information. 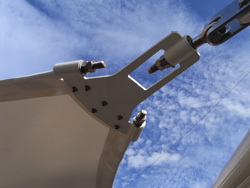 What does "tensile fabric" mean? Can any shape be created? If the fabric is not stretchy then how are the curved forms created? Why and how is the fabric tensioned? Can my tensile fabric have straight edges? What fabrics are best used for interiors and exhibitions? What fabrics are best used for exterior applications? What fire ratings do the fabrics have to achieve for interior use? 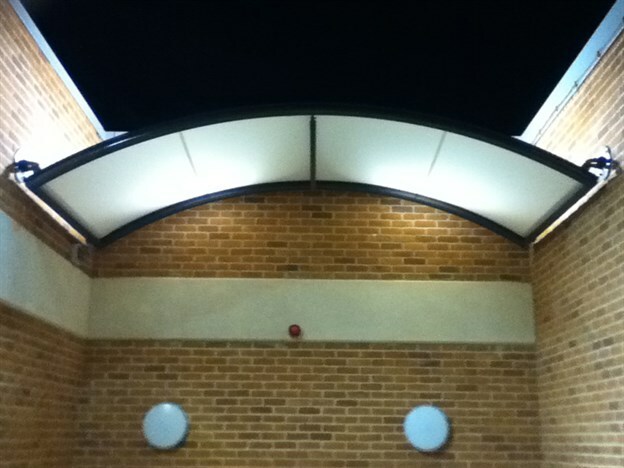 Every canopy uses the curves and principles of these three forms and the three may be combined on a single canopy. 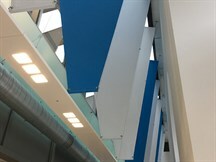 The fabric form is computer generated using a specific programme for the industry. This 'form' is then converted into flat panel which then can be cut out to create paper patterns or the information can be used to computer cut the panels on a plotter/cutter. Because of the nature of fabrics used, the presence of the double curve and the process of manufacturing, tensioning is always required in order to induce the correct shape and take out any minor creases in the fabric. In broad terms the answer to this is yes, although there are a few rules and a number of exceptions. The rules pivot around the fact that all canopies are created from three inherent shapes: the Barrel Vault, the Cone and the Hypar. Every canopy uses the curves and principles of these three forms and the three may be combined on a single canopy. Some forms, such as the 'inflated look' structure, can only be created by inflating. However, it is possible with the use of double curvature (Hypar being the easiest example of this) and spars to create the appearance of inflation. This can be done by pushing the fabric into shape, in the same way that a wind surfing sail is pushed into shape by its battens. 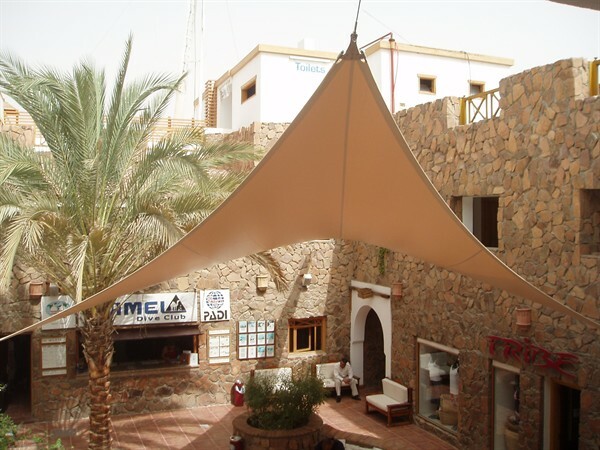 Contrary to popular belief the fabric used for tensile fabric structures is generally not stretchy. In fact a non stretchy fabric is preferred, as it offers the best predictability for the design and installation of the structure. Stretchy fabrics such as 'Lycra' and other 'Lycra' based fabrics can be used for certain applications but due to their low fire retardency, can generally not be used for interior or exhibition use in the UK. Although the flat fabric is not specifically stretchy, it will stretch a very small amount particularly across the bias of the fabric. If this stretch is more than a specific percentage, then the stretch amount has to be compensated for and thus the additional length that it will provide has to be deducted from the panel size. Because of the nature of fabrics used, the presence of the double curve and the process of manufacturing, tensioning is always required in order to induce the correct shape and take out any minor creases in the fabric. This tensioning can take many forms: from simply hand pulling a canopy into place and Velcro fixing, to tensioning a corner of a canopy with a rigging screw or turn buckle depending on the size of the structure and the way in which it is to be used. 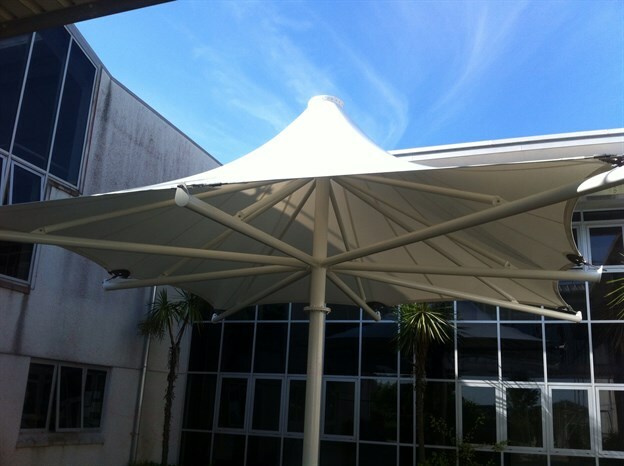 More information on this will be supplied to you once the size and design of the canopy is established. 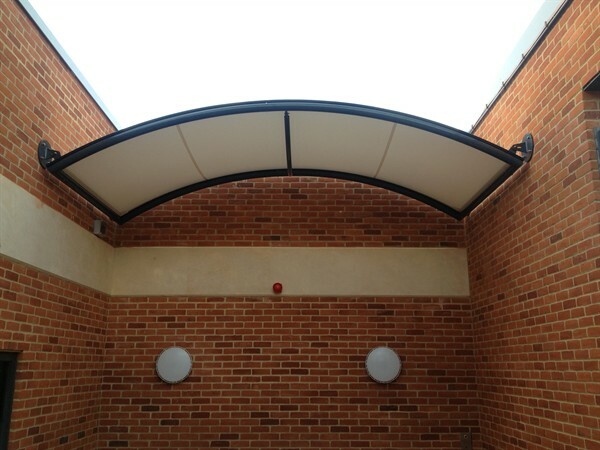 In general terms the answer to this question is yes, however it can be affected by the size and design of the canopy and the visual detail that is required. For this reason we recommend that you talk to us at the early stages of a design, allowing us to advise on the appropriate detail. Certain applications require higher fire ratings (see fabric chart). Brittle fabrics can fracture during manufacture and result in lines appearing in the cloth (uncoated glass fabrics) that, although do not effect the cloths strength, can be unsightly. Some uncoated glass fabrics are hazardous to handle and therefore are slow to work with or inappropriate for some applications. As per the interior and exhibition fabric recommendation, any type of fabric can be used to create a tensile fabric form for exterior use, but considerations to fire rating, water repelling qualities, wind loading, life span and UV breakdown are all factors that can effect the decision of what fabric type is chosen. Because of fire regulations, only glass based fabrics and high quality cottons can be used for most interior and exhibition applications. 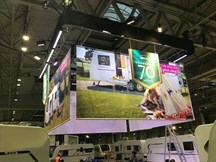 The glass fabric can be used for all environments as it simply does not burn (rated to BS476 pt 6 Class O (UK), M1 (France),B1 (Germany) allowing it to be used for screens, canopies and ceilings. The cotton fabrics, however, are rated lower (BS 5867), which depending on the application can restrict its use. Further advice on the fire rating of fabrics can be provided on request.